Our home is a beautiful oceanfront getaway located in an unspoiled Florida fishing village. We are located on the Gulf coast and enjoy both gorgeous sunsets and sunrises year round. We are within walking distance of the historic downtown and famous dock street restaurants and shops. If you are looking for a little relaxation in your next Gulf Coast vacation, you must discover Cedar Key, Florida. Our views of the Gulf are panoramic, our style is low-key, and we want you to kick back, get comfortable and most of all, have a great time! The Thomas Guesthouse is a 3 bedroom, 3.5 bath home. Our vaulted ceilings and wall to wall windows offer incredible views of Cedar Key's waterfront and nature preserves. If you are a nature lover, you will be mesmerized by the variety of birds and dolphins that feed in front of your private balcony. Throw open the wraparound windows and feel the sea air and breezes gently relax you as you watch a panoramic sunset filled with the most stunning imagery and colors. Enjoy sunrises with your morning coffee and the spectacular colors of the sunsets each evening. Cedar Key is surrounded by the Cedar Keys National Wildlife Refuge - a refuge famous for its extensive colonies of nesting birds. Depending on the season you visit, you will see Roseate Spoonbills, White Pelicans, Dowitchers, Willets, Skimmers, Oystercatchers, Frigate Birds, Wood Storks, and many LBBs (little brown shorebirds, from plovers to sandpipers). Always resident are: Great Blue Herons, Little Blue Herons, Tricolors, Great Egrets, Osprey, Bald Eagles, and many others. Our home is fully furnished and equipped for your comfort and convenience. Besides the fully-equipped kitchen, living and dining areas, we also have a laundry area with washer and dryer. Upgrades in 2008 include new bedroom and dining furniture. Cedar Key is perfect for couples or family vacations. Park your car and walk or use a golf cart to visit our restaurants, galleries, boat rentals, shops, and the town marina. Most dining and shopping options on Dock Street are two blocks from the Thomas Guesthouse. Bikes, scooters, and golf carts are also available if you would like to range a bit further. Cedar Key is part of Florida's Nature Coast--the wildlife is abundant. If you are looking to enjoy old Florida without the crowds, come to Cedar Key and relax on our balcony and watch the birds and boats go by. We promise you will not want to leave. Golf carts are for rent at the Gulfside Motel just down the street. We love the unspoiled Florida we have found in Cedar Key. Nice location but there was mold on all the AC registers. Thank you so much for letting us know. We have had our AC maintenance company go out to inspect/test for mold. It was a small amount mold (common in FL as I’m sure you are aware since your company provides AC vent cleaning services) — mostly accumulated dust and dirt. The vents needed cleaning and we again thank you for bringing this to our attention. We will be refunding you the cleaning fee and if ever you choose to stay with us again, please let us know immediately and we would be happy will send someone to rectify any problem. This place was awesome! We loved it and it’s a great location. Could use some small updates. However we will be saying here again in the future. 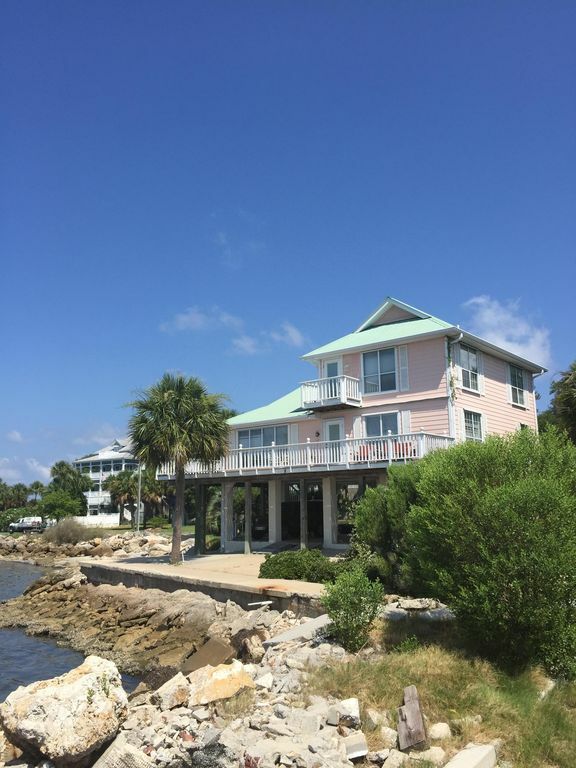 We enjoyed our week at the Pink House in Cedar Key. It was the perfect location for my husband and I and our son, daughter-in-law and 18-month grandson. The house is very well equipped, especially the kitchen. The beds were comfortable and there were 4 bathrooms. We rented a golf cart for the week from a great guy named Dell on A street where the fishing pier and many seafood restaurants are. It was our first time at Cedar Key and we were pleasantly surprised to find a small laid back "resort" town in this day and age. It reminded me of being in Maine. BTW, we didn't really need the golf cart since everything is only a block or two away but the golf cart was great entertainment and gave us the ability to explore the entire area. We rented a pontoon boat twice from Cedar Key Marina II and my husband and son enjoyed the fishing. We loved the 1842 Daily Grind & Mercantile for our morning coffee and delicious cinnamon rolls. Pay attention to their hours though - they aren't open every day and their hours' change. There is a public beach a few blocks away with a great playground. We loved Cedar Key and the Pink House and we will definitely go back. One word of caution though, the sun is very intense and the deck has no shade, so bring an umbrella for the deck or lawn chairs that you can use below the deck. Also, the house is not "toddler-friendly", we moved everything out of reach and wished we had brought gates with us, especially for the deck. This house may have the best view on the island for watching sunrises and sunsets on the water! There were also many days where we witnessed dolphins swimming nearby. It is a short walk to Dock street and the historic district shops and restaurants. One of our favorite places was the deck overlooking the water. So relaxing! The en-suite bedrooms are a huge plus as well as the half bath on the main level. The kitchen is well equipped although it could use some mixing bowls and plastic storage containers for leftovers. The stovetop is a bit challenging if you need to cook more than 2 items at one time due to half being taken up by the Jennair grill top. But there are lots of cooking pans and baking pans. We brought our own crock pot and Nutri-bullet blender. The furnishings and decor are a bit tired, but adequate. Upstairs beds are firm but comfortable. Master bedroom mattress leaves a little to be desired. Management company was very responsive to our needs. Overall, we had a wonderful stay. We would definitely stay here again! Absolute best location on the island! Absolute best location on the island! Great views of sunrise and sunset! Easy walk to everything! Amenities in the house are fantastic. Check in/Check out easy. Comfortable. Superb house and will visit again. Tony's Chowder is amazing and great burgers down town for those couple days we didn't cook. Island boat tours is highly recommended. TV's, beds, and living room furniture could do with an update. Some of the bed linen was smelly, we had to wash prior to sleeping. Great house on the water with fantastic views! We were amazed at how visible the stars were and saw tons of shooting stars! So cool! Enjoyed kayaking, a sunset cruise and the food was awesome! This place is old Florida, no chain restaurants or industry. Very peaceful and laid back. Highly recommend! Rates are subject to change. Holiday and festival stays will incur an additional 15% fee.